I confess that I spent many years of my tool-making life doubting that chip breakers break chips. I went so far as to start calling them cap irons in a feeble effort to shake what appeared to be a grand hoax inherent in the “chip breaker” moniker. My personal relationship to planes convinced me that, for the very thin shavings that fine woodwork finish-planing demands, a sharp blade and tight mouth were the primary contributors to tear-out-free planning. Who needs to “break” a chip that is thinner than tissue paper? I was right. And I was wrong. Turns out chip breakers do break chips. But they have to be tuned and adjusted to do the job properly. I wrote a brief synopsis a while back. A chip breaker (aka cap iron or back iron) performs more than one task in the seemingly simple yet elegantly complex machine that is the Bailey pattern-type bench plane (aka Stanley or Record or Millers Falls or Montgomery Ward or Fulton or Preston or Craftsman or Lie Nielsen or Veritas). In bevel-down planes such as these, the cutting edge is cantilevered, unsupported, the whole length of the bevel. Regardless of the thickness of the blade, as the blade “sings” through the wood, that cantileverage allows for some amount of vibration of the cutting edge. A properly made chip breaker has some amount of bend in it – like a leaf spring. While the Stanley breaker has a rather pronounced curl, Hock Tools’ breakers have a slight 1-degree bend. When screwed tightly to the blade, the spring-action of the breaker applies pressure right at the cutting edge. In fact, it’s not uncommon for the breaker to flex the blade with the spring pressure it applies. The very presence of a chip breaker pre-loads the cutting edge – flexing it down to stifle vibration – and making the whole cutting system more rigid. Another job relegated to the chip breaker is that of blade advancement functionary. While it is stiffening the cutting edge and breaking chips, the breaker is integral to, and serves a vital role in the depth-of-cut system. When you turn the adjuster wheel located in front of the tote to make a thicker or thinner shaving, the wheel moves along a threaded stud to swing a little lever fore or aft. That little lever is hinged in the frog such that it passes through the blade, engages the small rectangular slot in the breaker, and then slides the blade-breaker assembly up or down along the frog. So, we now have the breaker rubbing its tummy and patting its head as it damps the cutting edge and moves the whole business up and down. Why not make it break some chips, too? When set very close to the cutting edge – like a few thousandths of an inch! – the shaving, sliding up the very short edge projection, encounters the abrupt and unyielding wall of the chip breaker and … breaks! Breaker should be set closer than this. That’s right, the shaving is deflected from its desired path, and must bend sharply up, and then out of the plane. That acute bend, combined with the very short edge extension, weakens the wood fibers so that they cannot lever up ahead of the blade and tear out. Voila! No gap shall be tolerated. All that said, the breaker’s chip crushing action will work against you if the breaker isn’t meeting the back of the blade with a near air-tight fit. No gaps at all. Finish shavings are very thin – like 0.0005” – and will catch under the most seemingly insignificant gap. When a shaving catches, it creates a miniature Pres-to-log that clogs the mouth of the plane. Some planemeisters go so far as to run the point of a sharp awl along the blade-breaker joint to roll a small burr down against the blade to close any remaining gap. Reasonably flat sole. You needn’t go all NASA on this point. Flatness ahead of the mouth is necessary. No bump behind the mouth can be tolerated. Mostly flat everywhere else. And coarse grit is fine. Relax. Leading edge of mouth should be sharp and square. That edge wears rounded after miles of shavings rub against it. So, once or twice in your lifetime, check it out and file it sharp and square. It’s holding down that shaving as the blade advances to also help prevent tear-out. Treat it with respect. Blade – sharp. And if you’re new to all this, sharper than you thought was sharp. … to make a smooth slide for the shaving to exit the plane. Chip breakers are usually unhardened steel that can be bent if necessary. If your breaker is lifting at one corner, try securing it in a vise and tapping or twisting it flat. Test it fully tightened to the blade, as oftentimes the twist or gap will flatten out when the screw is tightened. And, the breaker can be further tuned by refining the ramp surface similar to how you’d prep a blade: polish with successively finer grits to create a slippery slope for the shaving to slide up. If all that doesn’t make your plane sing a sweet melody while ejecting lacy, see-through shavings, call me: 1-800-327-2520. Just kidding. That’s Lie-Nielsen’s phone number. But honestly, if you have a plane problem that you can’t suss out, contact me here. I’ll do my best to help. 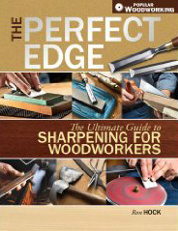 There is a lot of info about planes, blades, breakers, steel, abrasives and so much more in The Perfect Edge: the Ultimate Guide to Sharpening for Woodworkers. Order your copy now! I’ve always had troubles with chip breakers. And this article really helped me out. Your stuff is the best ! I found several things to check and try here. I suspect there are cures for some things I’ve been experiencing in my near future. Many thanks! GREAT article, thanks Ron. Question: I usually sharpen with a slight camber at the blade edges to reduce occasional gouging, how close do we set the chip breaker with the curved blade edges?